So Marvel has a huge plan of movies all the way through 2028, but apparently Miles Morales' Spider-Man isn't a part of it. Well, ok, it sounds like NO non-Peter Parker Spider-Men are going to be a part of the future film plans. An apt commentary for the picture. Are Miles Morales ("Ultimate Spider-Man"), Ben Reilly (clone Spider-Man) or Miguel O'Hara ("Spider-Man 2099") on the table? If you want a Spider-Man movie every year why not bring in some of the other variations? Arad: No. The one thing you cannot do, when you have a phenomena that has stood the test of time, you have to be true to the real character inside – who is Peter Parker? What are the biggest effects on his life? Then you can draw in time, and you can consider today's world in many ways. But to have multiple ones… I don't know if you remember, but Marvel tried it. And it was almost the end of Spider-Man. So Spider-Man in the cinematic realm will always be Peter Parker? That seems a little odd though. Arad is referring to the Ben Reilly "Clone Saga" series, which was quite unfavorably received. In the mid-nineties pretty much all comic stories were ridiculous and then the fact they drug it out over years of convoluted storylines made it even worse. Having Ben Reilly as a clone, then making Peter the clone, then his parents were cloned. It wasn't that there were other Spider-men that almost ruined the character, it was how they handled the other ones. Marvel planned a giant story and promised a bunch of answers that never came, it failed miserably. "I have given that thought. I think one of the amazing things about Spider-Man is that you don't see skin color when he's in the suit. You don't see any religious beliefs. You don't see any denominations. Everyone can project themselves into that suit. It's incredibly powerful in that way. So of course I think it's important that the openness, the casting, in terms of who could be Spider-Man, could be absolutely anyone. A hero is a hero, whether you're a man, woman, gay, lesbian, straight, black, white or red all over -- it doesn't matter. Miles Morales was a huge moment in this character's comic book life. And I do believe that we can do that. It's something I'm really interested in figuring out; an eloquent way of coexisting, or passing on the torch. I don't have an answer, but I think it's actually a really important move. I think it's a really beautiful and important move." Really, there were plenty of failed Spider-Man stories, so why not take a chance on this one. Broaden the cinema audiences with something good. We could use a mixed race hero. It sounds like a massive plan to continue to tell the same stories to the same fans. Where's the Marvel ability to adapt to new markets? Is being inflexible to their "big picture" worth that much? I think we need some more non-white-male hero films. 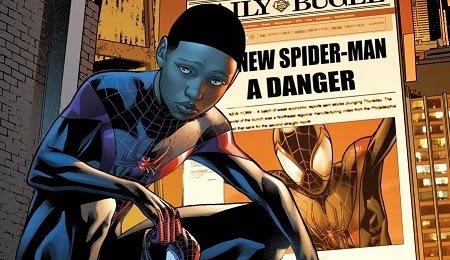 Miles Morales would open up a lot of ground, and a great story, for a new demographic. Midi-Chlorians For Sale: Down on his luck Luke.